And 53 percent of Americans are concerned that a mass shooting could happen at a school in their community. By a 63-to-43 percent margin, women are far more concerned than men about that possibility. 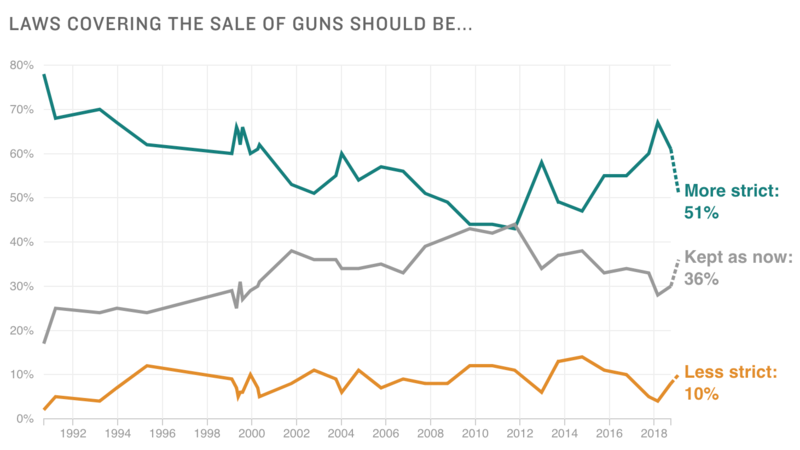 A big reason for the decline in support for gun restrictions and the increase partisanship is the National Rifle Association, the most powerful pro-gun lobby in the country. Americans have a mixed view of the NRA with 42 percent having a favorable opinion of it and an equal 42 percent with a unfavorable one, according to the poll. The NRA struggled in the months following the Parkland shooting. It reported a revenue drop of $55 million. Executives cut budgets, and its streaming TV arm, NRATV, was hit with layoffs. But there's some evidence opposition to the NRA may be softening some. In March 2018, 40 percent said they were more likely to support a brand or company that had cut ties with the NRA. That's down to 31 percent now. Thirty-seven percent of Americans say they less likely to support a brand or company that has cut ties with the NRA, the same percentage as in March 2018, according to the survey. And among nonwhites, there is a nearly 30-point gap between those who say it is more important to control gun violence (67 percent) compared to those who say it is more important to protect gun rights (28 percent).